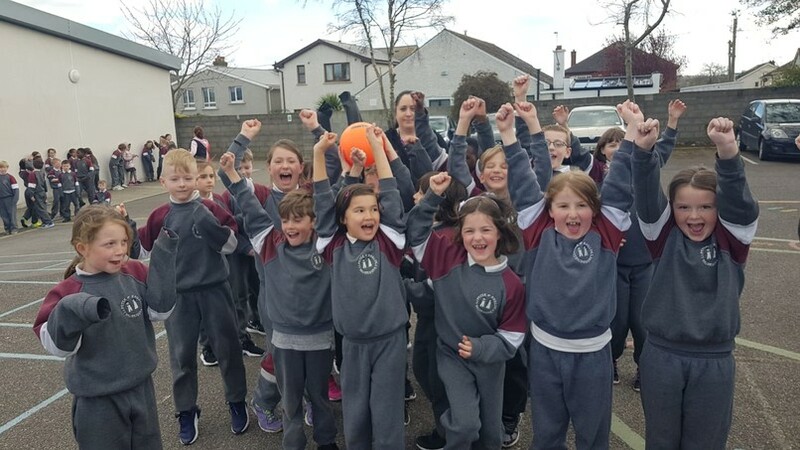 We had a fun filled week planned for our second annual Active School Week. 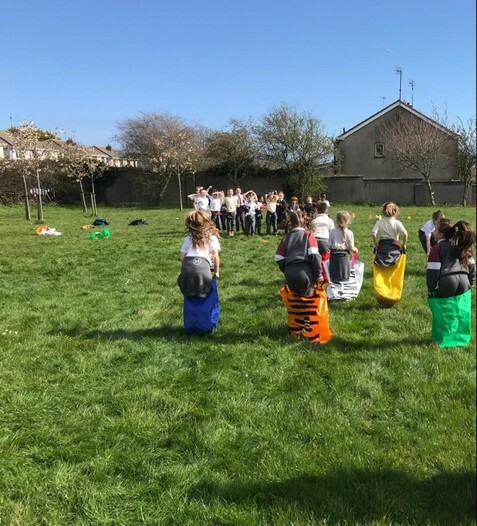 This year we incorporated some new activities, such as a "Scoot Around the Yard", a "Take on the Teacher Challenge" and we finished with a "Whole School Dance". We were blessed with the weather, the sun shone down on us all week and everyone had a fantastic time. 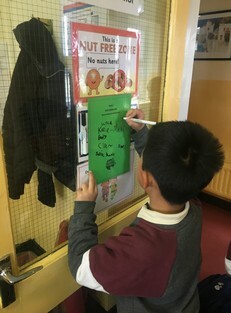 All week instead of written homework the children were given active homework to complete instead. Click HERE to take a look at some of the activities they took part in at home. 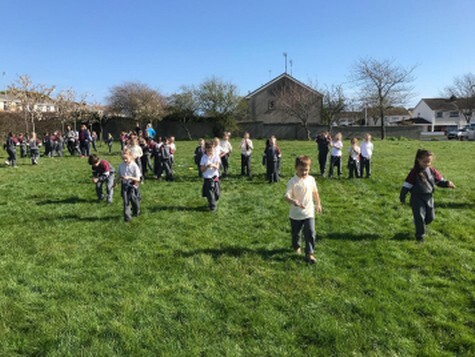 We kicked off Active School Week 2019 in style with our first ever "Scoot Around the Yard" at 9:20am. Each child was asked to bring in a scooter from home and a helmet. If they did not have a helmet or scooter they were teamed with a buddy to share. 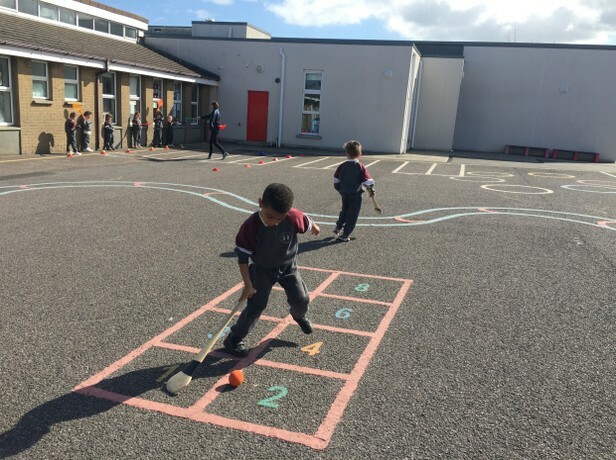 The Junior Infants were the first classes to show us their scooting skills and they did a fantastic job. Well done boys and girls. Every Morning at 9:50am our Active School committee members made an announcement over the intercom for all classes to drop what they're doing and "Wake Up, Shake Up" their bodies. 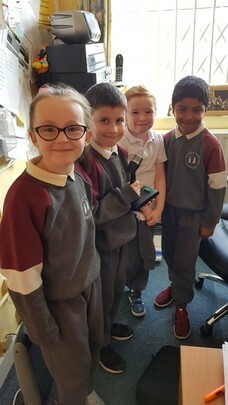 Here are some of our wonderful Active School Committee announcing the morning activities over the intercom each day. On Monday they called out 5 different activities for everyone to do in their class. 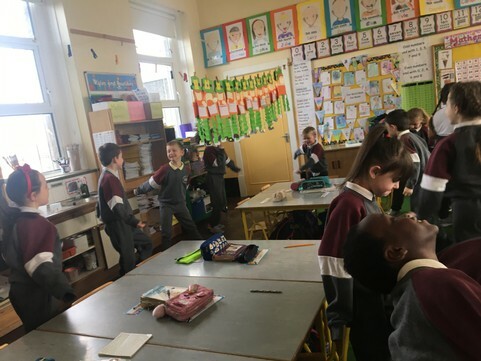 Here are the Senior Infants doing their squats and lunges. After our Wake Up, Shake Up, the classes all took part in the 10 @ 10. We are very fortunate to have a parent in the school who is a dance instructor. Lorraine very kindly offered to come in and teach ALL the classes a dance routine that they will perform as a whole school on Friday. 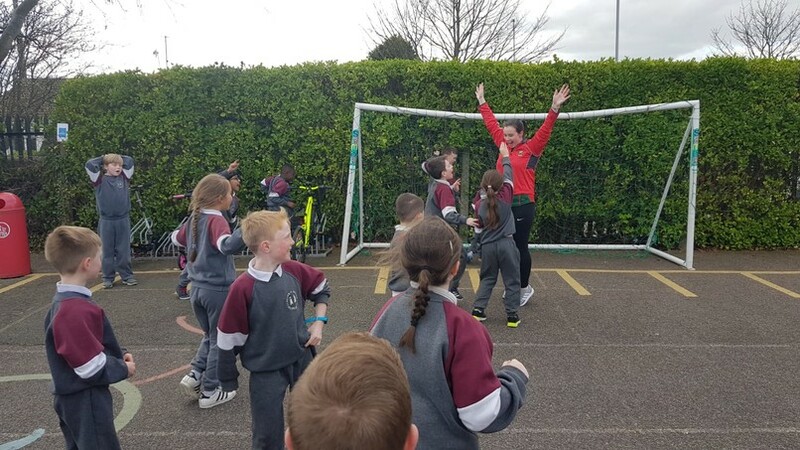 Here she is putting the Senior Infants and Second classes through their paces. There were lots of great activities set up on the yard that were taken from the Be Active manual. 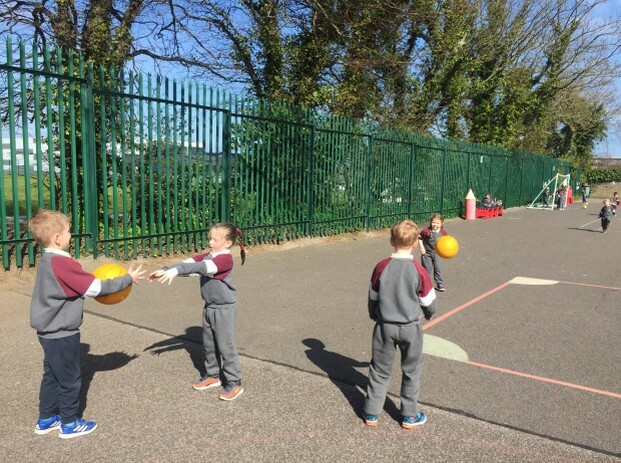 The children were developing their tennis, basketball, football and hurling skills. 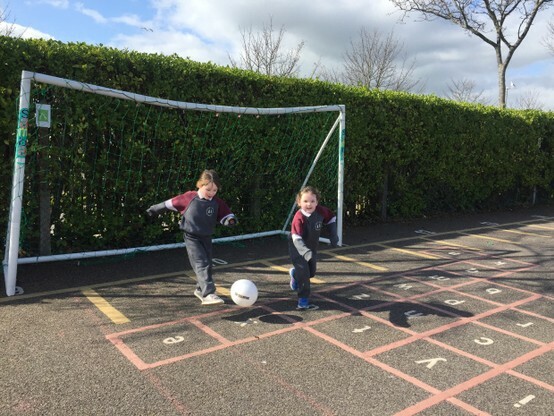 Here's Ms Ní Mhaonaigh's Junior Infants working on some of these skills. 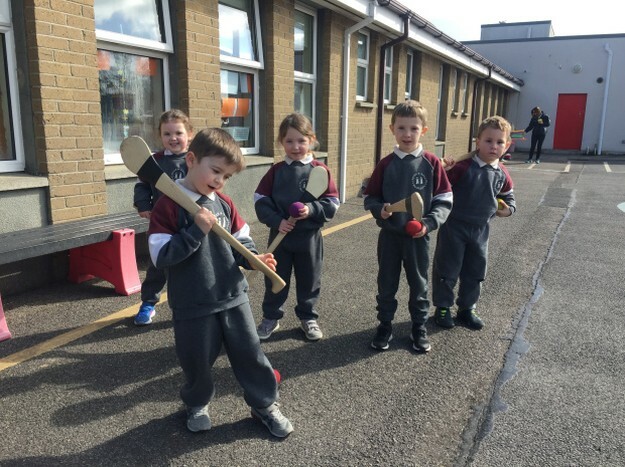 It was the Senior Infants turn to Scoot Around the Yard this morning. 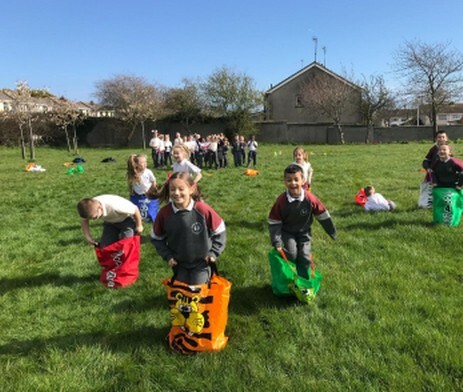 Again we were blessed with beautiful weather as all four classes showed us their best scooting skills. Today for Wake Up, Shake Up, the school had to hop on one foot for a minute, then jump for one minute. It's not as easy as it sounds. 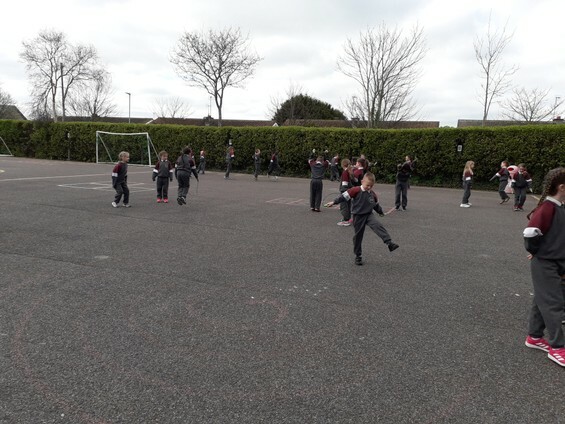 Each day of Active School Week a class level trekked over to our local field to take part is some fun field games. Some of our parents came with us to help out and take part in the games. Here are the boys and girls from First class having a great time in the sunshine. Wednesday morning started off with the children and their parents committing to walking to school in the morning to get some extra exercise. 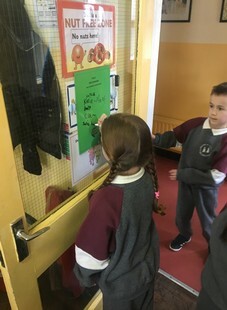 Those that managed to walk to school wrote their names on a card on their door and received a sticker. We were delighted to see that the majority of families walked to school so hopefully they'll keep it up. Once again we kicked off the day with a "Scoot Around the Yard", this time it was the First classes' turn. As part of our morning activities today the Active School Committee announced over the intercom that the whole school would do some Cosmic Yoga. It was very relaxing...zzzzzz! We love to promote local sports clubs and physical activity providers in our school. 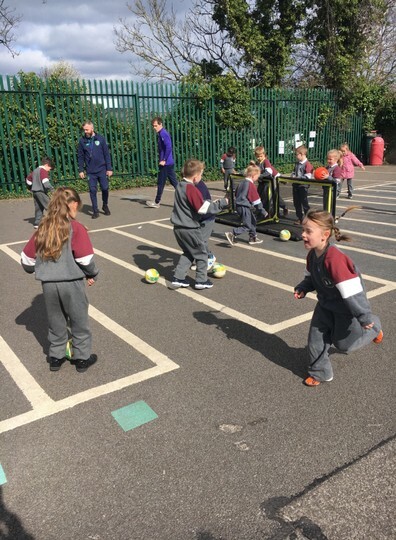 So as part of Active School Week, we invited coaches from the F.A.I to come and give taster soccer sessions to the boys and girls. 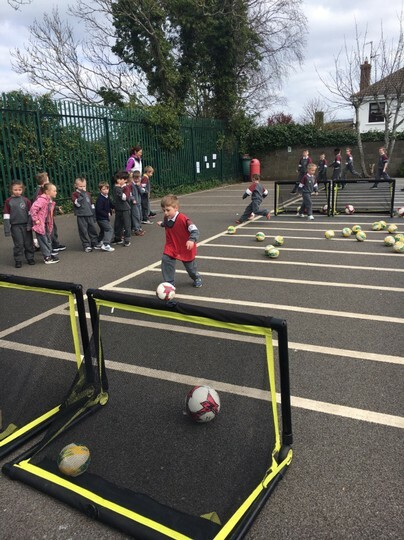 Paul and Keith organised some wonderful activities for all the Senior Infant classes. Thank you so much, we all really enjoyed it. 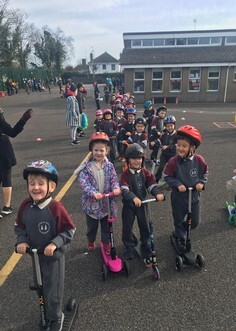 It was the last day of our Scoot Around the Yard and it was 2nd classes turn to bring in their scooters. They all had so much fun and were exhausted afterwards. Ride a bike, jump on a trampoline, chop down a tree, shake like a wobbly jelly bean, make a pizza, jump like a kangaroo, kick like Ronaldo, dance like a rock star, sweep the floor and clean the windows. Here's First Class kicking like Ronaldo!! After that we went straight into our 10 @ 10. The Junior and First Classes are learning the dance moves with Lorraine today for our Whole School Dance tomorrow. 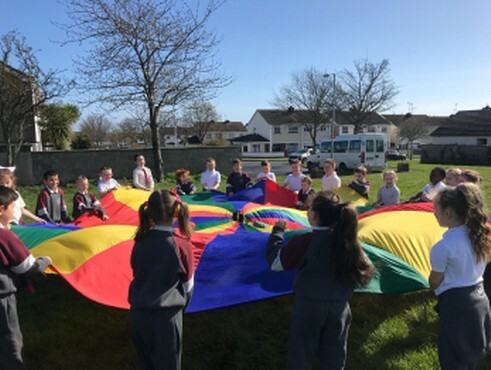 The First and Second classes took part in a "Climb the Heights Challenge". They had to skip for 10 minutes where each skip equalled 1 metre. 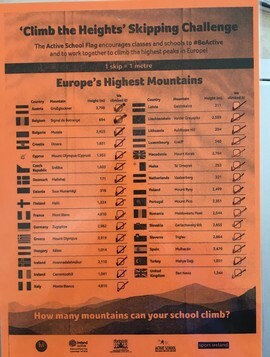 Mrs O Connor's class managed 7960 skips, which meant they climbed higher than many European mountains! 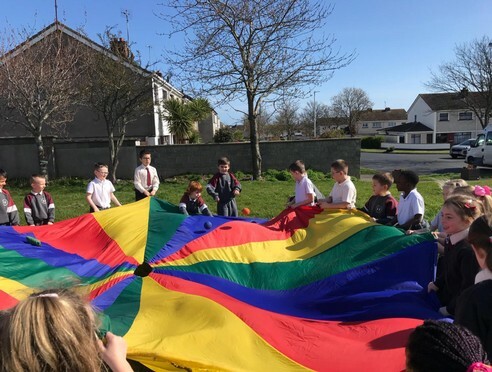 Its the last day of our Active School Week and even though we were all quite exhausted (the teachers especially), we were all really excited for all the activities that were planned for today. Inniu, bhí na gníomhaíochtaí “Wake Up, Shake Up” i nGaeilge. 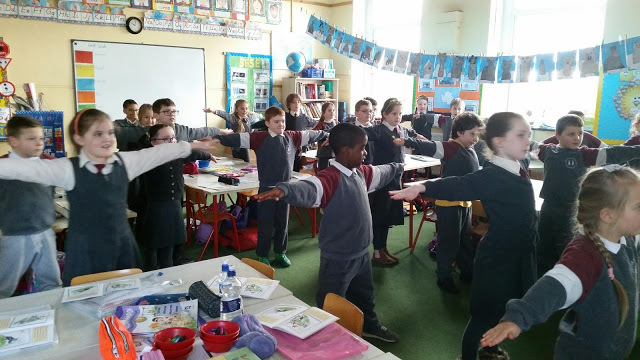 To finish our Morning activities the classes took part in some mindful meditation. It was just what we needed after such a busy week. 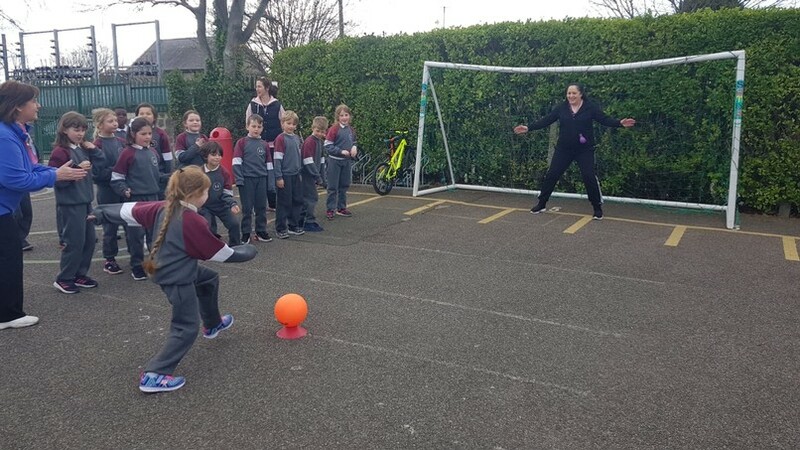 The stakes were high as the students took on the class teachers in First and Second class. There were penalty shoot outs, relay races and basketball shots. 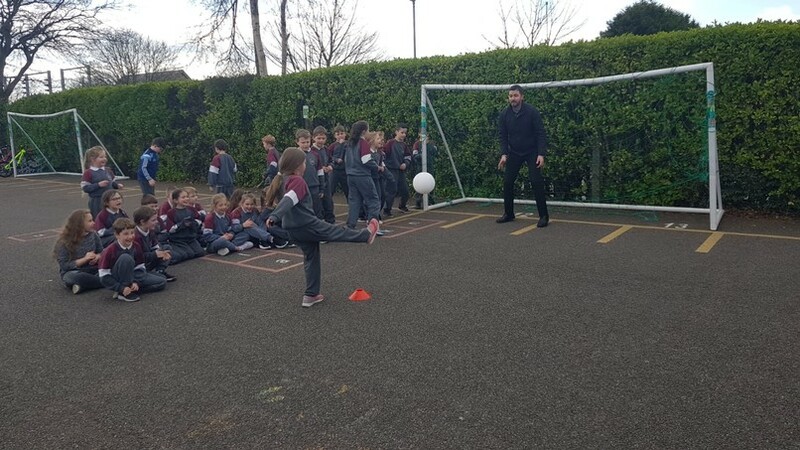 It was a very tense competition but even though the students tried their best the second class teachers were on top form and came out as the winners in the penalty shoot out!!! However, not to be outdone, the children from Room 6 worked together and in the finale won against their class teacher. Teacher does not look too happy with the result!!! We finished off our Active School Week in style with a Whole School Dance. All week the boys and girls have been learning dance moves taught to them by one of our talented parents, Lorraine Jackson. Today was the day to show off their skills and WOW what an amazing job the children did. Check out our photos and videos below.